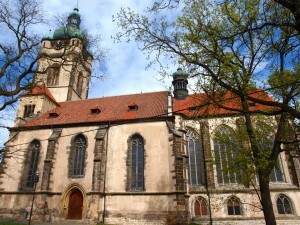 The Roman Catholic Church of St. Peter and Paul in Mělník is one of the oldest churches in Bohemia. The triple-nave Gothic church is dominated by a 60-metre-high square tower with a Baroque end that forms the dominant of Mělník and towers over the confluence of the Elbe and Vltava rivers. There is a crypt with an ossuary under a chancel of the church. 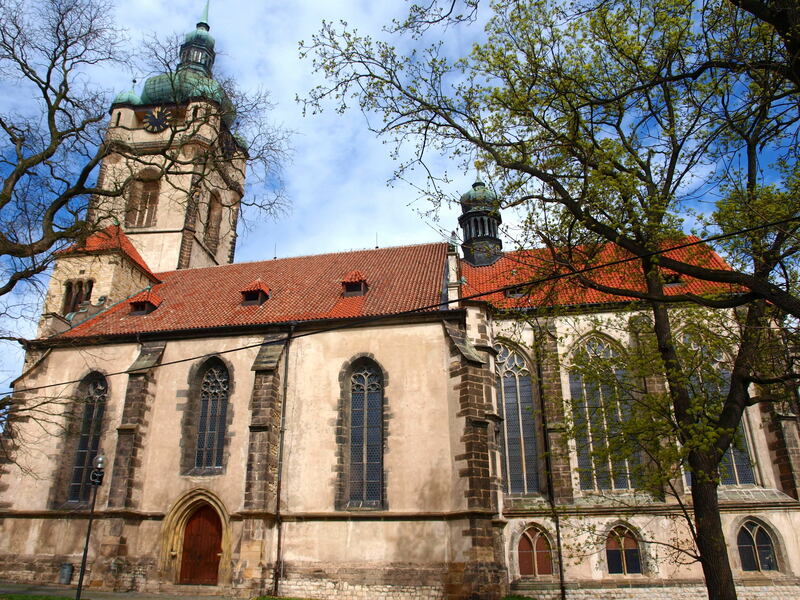 The beginnings of the church date back to the period around 1000 – the time of Princess Emma (+1006), the wife of Boleslaus II, Duke of Bohemia. The tower was built in 1483-1488 and the triple-nave is from the same period. The church has its current form since 1520. Minor modifications were made after the fires in 1555 and 1681 (Baroque onion dome of the tower), as well as during the complex reconstruction of the church in 1910-1916. The church has been protected as a cultural monument since 1958. Interesting are the bells, probably cast by the Prague bell-maker Egidio-Jílek in 1410. They melted in the fire of the church in 1681. Three new bells from the workshop of the Mladá Boleslav bell-maker Jean Pricquey were put in the tower only in 1690. Only two of them remained, ‘St. Peter and Paul’ and ‘St. Wenceslaus and Ludmila’. Václav Koníček acquired a replacement for the third bell and the Holy Bishop Josef Koukl consecrated him to St. Agnes and Zdislava in 1993.